Rowdy, pub-style Irish band playing your favorite Irish, Scottish, American, and Canadian folk songs, drinking songs, and sea shanties. 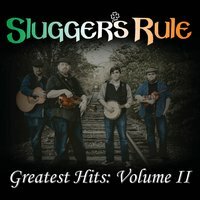 Slugger’s Rule’s own brand of Celtic and Folk music began around the campfire. It started off getting together around a fire with songs, stories, and a healthy amount of booze. Over time, instruments were added and other influences surfaced, such as new songs from different countries and even a hint of bluegrass in their harmonies. However, their performances today stay rooted to the original fire pit where they would drink, entertain, sing, and discuss the history and meaning of the music that they love. Today, they sing a collection of Irish, Scottish, Canadian, American, British (only a few!) folk songs and sea shanties. They claim influence from classic groups such as the Clancy Brothers and The Dubliners but also from more modern groups such as The Pogues, Gaelic Storm, and Great Big Sea. Their music is a story and the performance is a conversation with the audience. Check us out on Facebook, or on our website!